Richard Trimmer, regional manager, Kumon Ireland; Martina Thomas, English completer; James Coyne, CEO Westside Community Resource Centre; Mayor of Galway Cllr Niall McNelis; Stephen Murphy, completer; and Irene Murphy, regional director, Youth Work Ireland Galway, at the Kumon Galway City West awards. Photo: Murtography. Martina Thomas and Catherine Jose both completed English in the first year of secondary school. Stephen Murphy is the first Galway student to complete a Kumon programme while still in primary school. 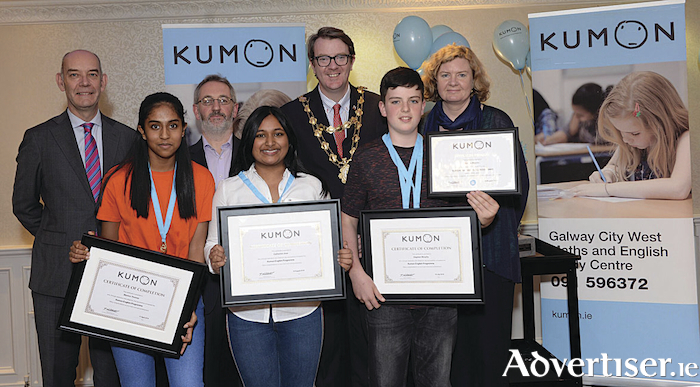 These young people spoke about their Kumon experience, their initial reluctance to do extra work, and the difference this daily commitment has made to their lives. Kumon aims, through individualised maths and English programmes, to develop strong capable people, thus contributing to the global society. These confident, mature, and articulate young people are well positioned to take their places in their world. The Kumon programmes stretch from preschool to university entry level, and are open to students of all ages and ability. Many students achieve levels far above their school levels. Gold medallists are working at least three years ahead of their school level. Fifty nine medals were awarded on the night, along with certificates and other prizes, all presented by the Mayor of Galway Cllr Niall McNelis. For further information on Kumon contact Denise Heneghan at 086 8285780 or [email protected].